A rogue Marine Corp General steals a biological weapon and seizes the island of Alcatraz. He holds San Fransico hostage and demands that the U.S. government recognize and pay benefits to soldiers who died in covert off-the-book operations. The FBI recruits the only man who has ever escaped from Alcatraz as a consultant to stop the general. They want him to sneak a SEAL team and a chemical engineer onto Alcatraz so they can defuse the missiles, which contain a lethal nerve agent. This may come as a shock, but there was a time when Michael Bay directed something other than "Transformers" movies. We know it's hard to believe considering five of his last seven films have all been part of that franchise. Back before he made boring garbage produced by himself, Bay actually made some entertaining garbage produced by Jerry Bruckheimer. 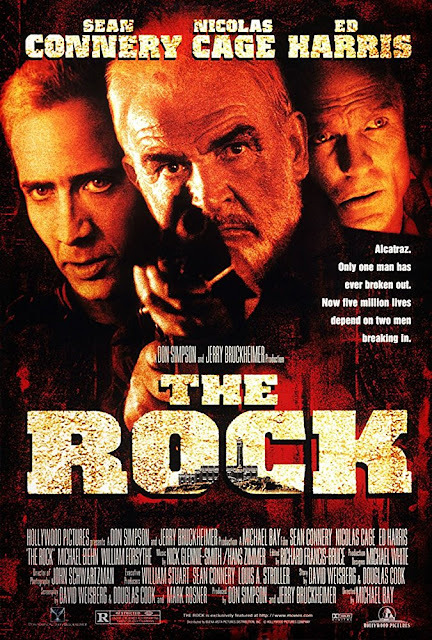 One of those movies is "The Rock," which stars Nicolas Cage as Stanley Goodspeed, a biochemist who works for the FBI in Washington D.C. 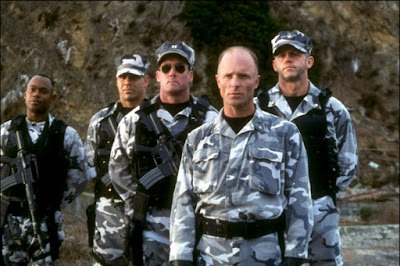 When a rogue but highly decorated Marine Corp general (Ed Harris) steals a deadly nerve agent from a government compound, he and his team of loyal mercenaries siege Alcatraz Island in California and use it as a base of operations where they plan to use the chemical weapons to take San Francisco hostage. Goodspeed, a Navy SEAL strike team, and a convict named John Patrick Mason (Sean Connery), who once escaped the infamous prison, must team up to stop the mad general. "The Rock" is a quintessential dumb-but-fun action romp. 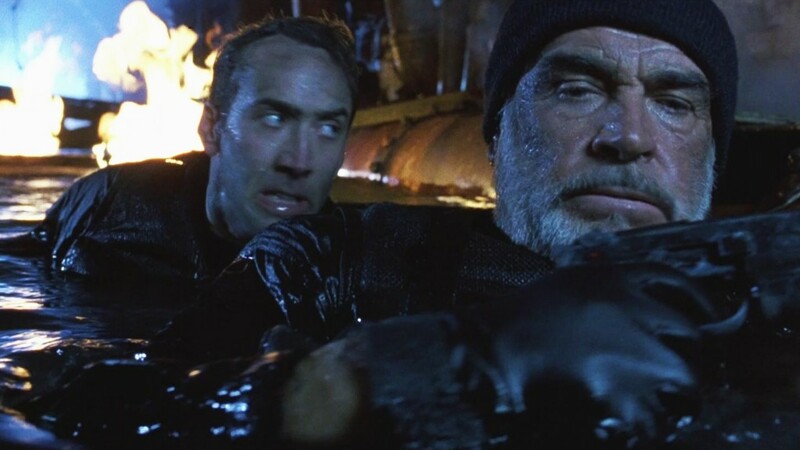 It features Nicolas Cage at his most Nicolas Cageian, and his bizarre, spastic, over-the-top mannerisms are on full display and dialed up to 11. Cage is one of the wackiest biochemists you've ever seen, and damn it, it makes for a good time. Sean Connery, on the other hand, is playing a much more serious character. It's as if the two actors were working off of two entirely different scripts. Being the consummate professional, Ed Harris gives his role of General Francis X. Hummell some weight, even though he's fully aware of how ludicrous the story is. Despite a couple of much-too-heavy moments, "The Rock" strikes a tone where it knows how ridiculous it is and doesn't want the audience to take it seriously. If it were trying to be a politically-charged action thriller, it would have been a failure. As a silly popcorn movie whose only purpose is to create big blowout action sequences with a lot of enjoyable, absurdly farcical moments, it works really well. 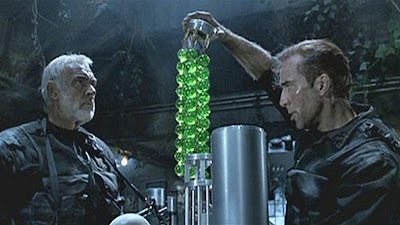 Like most Michael Bay films, "The Rock" could have been a bit shorter. There is a moderate amount of filler that could have easily been cut from the film. Michael Bay has never had any concept of truncation, so a long runtime is typical for him. This flick is still loaded with all of the Michael Bay tropes we have come to love??????? ?, like excessive explosions, the overuse of slow motion, some random admiration of the male physique, women only existing to add personal stakes for the men if they fail their mission, and over-the-top, obligatory patriotic pandering. In the end, though this movie isn't perfect, or technically even that good, we remained entertained by "The Rock" in all of its sheer absurdity. It's a goddamn fun movie to watch.